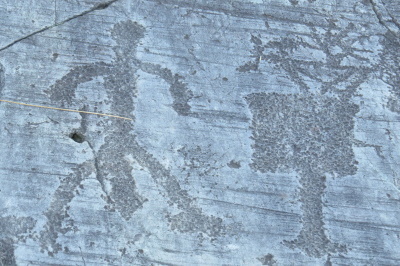 The Rock Drawings in Valcamonica comprises one of the largest collections of prehistoric rock art in the world. 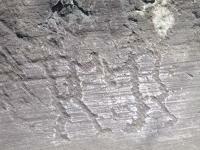 It holds approximately 250,000 petroglyphs, divided over 6 separate locations in a valley in the Italian Alps. The rock art was created over a long period of time, starting around 8,000 BC with nomadic hunters. The greatest number was drawn by members of the Camunni tribe in the first millennium BC. Cosmological, figurative, and cartographic motifs are featured, in some locations forming monumental hunting and ritual 'scenes'. Among the most famous symbols found in Valcamonica is the so-called "Rosa camuna" (Camunian rose), which was adopted as the official symbol of the region of Lombardy. The drawings were first documented in 1909 by Walter Laeng, a Brescian geographer. In 1979, the site became the first Italian WHS. Valcamonica was my first stop on a very full day ticking off WHS in the Italian Alps. This valley lies just over an hour to the north of Brescia, and can be reached via a major road that passes numerous tunnels. I opted to visit the Naquane Park in Capo di Ponte, as it seemed to be the most worthwhile among the 6 locations. The park lies on a hill above the town, so you have to leave your car in the center (the closest parking is at the cemetery behind the train station) and walk up. The path is signposted. It's a climb of about 15 minutes. Of course I was the only visitor at the gate. The park distinguishes itself among Italian attractions as it has long opening hours all through the year. It's only closed on Mondays, but otherwise open each day from 8.30 a.m. into the late afternoon. I don't know how they handle it if there's a lot of snow - the path up and through the park would be too slippery I guess. And they would have to clear the snow from the rocks to keep the drawings visible. There's an entrance fee of 4 EUR, and I was welcomed with a leaflet in English and explanations about which route to take to see the major rock drawings. The most impressive ones are the numbers 50 (right at the beginning) and 1 (the biggest and earliest discovered). The Camunni appear to have been obsessed by deer with elaborate antlers, men with giant penises and shovels. At least these are the main objects they carved into the rocks. The 'shovels' (spades) are a recurring theme among other rock art sites, however their meaning is not clear. Since Paul's visit as described below, the site has improved on explanations. Each of the main groups of drawings now has an information panel, with text in both Italian and English and sketches of the drawings so you know what to look for. To make it even easier, in the top right corners of each panel there is a 'map' of the particular rock, with the drawings marked with red dots. The drawings are very clearly visible on rocks 1 and 50, but much less so on other rocks. For example rocks number 70 and 73 are said to display a god and houses, but I did not see anything. A couple of the rocks are also disturbed by footprints made by modern humans with shoes. I don't know when that happened, but they seemed very recent to me. April 2016 I visited Cape di Ponte on my University research project- an ethnographhic research on the area. In January 2016, I sent an email to the centre asking to purchase a visitors brochure before I came- (EU10) and received the reply in September 2016! April 2016 i went with my husband to visit the site and was told that I could not take a monopod- could not take video, but could take photographs. I returned to the car and put back the monopod, and set the camera on photo. Despite the attendant having received all my all my ID, including viewing my Italian passport he followed us around the park to 'watch' what I did! Very uncomfortable feeling- and how sad that visiting scholars should be treated as vandals. I visited this WHS in May 2014. 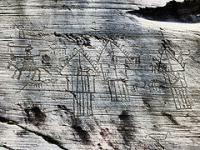 After reading several reviews, I decided to visit the rock drawings of Naquane in Capo di Ponte. The park is open from 8:30am which was perfect to be able to check out the orange route first which takes about an hour. On a sunny day the first sun rays are visible on the most famous series of rock drawings Rock 50 and the Big Rock. There are reindeer, hunters, shovels, animals, geometric signs, hunting scenes, horses, carts, etc. 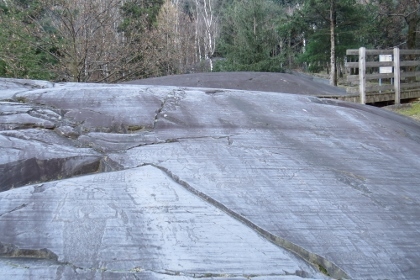 Unlike the rock art I saw in Alta, Norway, the rock drawings of Valcamonica are not filled in with red ocre so the different engravings and iron tool marks are more visible in the main rock drawings. 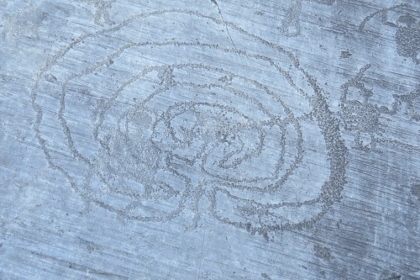 Some rock drawings are completely covered with vegetation or overgrowth or simply with mud. After the orange route which gives you a very good overview of rock drawings, another 45 min trail uphill takes you to the red route to see other rock drawings with one of the most famous being the running athlete drawing. However, an extra effort through a 35 minute downhill trail will lead you to my favourite rock drawings of Valcamonica - a series of pile dwellings - which was the next WHS I was going to visit later on. I travelled by train from Brescia to Capo di Ponte, and from the station climbed up to the park of Naquane as has been described below. Afterwards I returned to the village, crossed the river and found two further areas of rock engravings. The Massi di Cemmo comprises two large engraved rocks in a field. The Seradina-Bedolina area is much larger and involves much scrambling over rocks. But the engraved rocks are marked and easy to find. I have been once in Valcamonica, where are a prehistoric complex, realized in a period of 8000 years, extended in a 70 km long area and not yet completely explored, of 2400 rocks with 140000 engraved symbols and figures, that evoke scenes of navigation, dance, war, agriculture and magic. 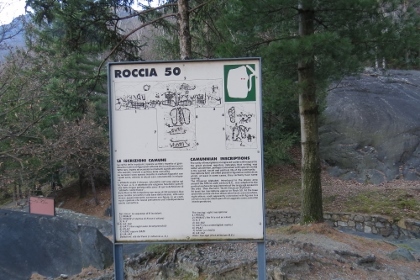 I have been to the sites of Foppe di Nadro, near Ceto, in the Regional Park of the Rock Drawings of Ceto, Cimbergo and Paspardo, and to the National Park of the Rock Drawings of Naquane, founded in 1955 near Capo di Ponte as the most important in Valcamonica, 30 ha large. In Naquane are 104 engraved rocks going from the Neolithic period to the early Christian age. The most important rocks are: the Big Rock 1, the most important in the valley, with about 1000 drawings with a labyrinth, armed men, sun symbols, cult objects, foots, birds, shovels, carts, warriors, riders, priests and scenes of hunting of deers, war, weaving and women's initiations from the Neolithic period to the Iron Age, the Rock 47, with a cart with wheels drawn by ox, fighting warriors, shovels and mythological figures, the rock 50 with armed men, riders, cart constructers, boats, birds, inscriptions, foots, temples, buildings, shovels, sun symbols and scenes from the Iron Age of a sun cult, the rock 35, with a small village, a smith, a runner with a plumed headdress, scenes of duels between armed men, the rock 32 with a female initiation scene from the Eneolithic Age, the rock 44 with axes, deers, warriors and shovels, the rock 6 with lances, the rock 99 with a Latin inscription and scenes of duels, the rocks 70 to 75 with huts, sun symbols, temples and an ancient god, the rock 23 with a cart with four wheels, the rock 60 with a rose and the rock 57 with deers and a plough. In Foppe di Nadro the most important rocks are: the rock 1 with scenes of a sun cult with prayers, armed men, duellists and medieval crosses, the rocks 4, 22 and 23 with halberds, daggers, axes, symbols and scenes of dancing and ploughing, the rock 6 with huts, stars, foots, duellists, warriors and symbols, the rock 24, with huts, dances, flautists, duellists, warriors, animals and symbols, the rocks 26 and 27 with duellists, warriors, riders, prayers, huts, temples, idols, dogs, inscription and symbols, the rock 35 with stars and the rock 36 with a bowman. This site is one of the most beautiful places I have ever seen because of the beauty and the antiquity of the drawings. It's absolutely worth to be visited (it's quite hard to get to the valley and you must walk a lot in woods for visit many drawings) because it is the most important complex of rock art in the world and justifies the inscription. Having already visited the Scandinavian WHS Rock art sites at Tanum and Alta we didn’t want to miss the Italian site at Valcamonica during a visit to N Italy (though we still have to visit Coa Valley in Portuagl). We found information about it somewhat lacking/muddled however. The UNESCO Web site was (as usual – why don’t they have better directions/location details!) singularly uninformative about exactly where the site was and its “link” to http://www.rupestre.net/ seemed of more use to specialists/ “rock art buffs” than to passing tourists! We eventually traced the site to an area north of Brescia concentrated around the town of Capo di Ponte. It was clear also that there were several/numerous sites in the area so we just drove there and took our chances. On arrival in the Capo di Ponte area the first signposts led us to a museum “The Regional Reserve of Ceto-Cimbergo-Paspardo” at Nadro. On closer investigation this appeared to be a joint venture with a tour company called Kernunos Viaggi who wanted to take/guide us (at a cost!) to various nearby locations as per the museum title. At Naquane you can follow various short footpaths among a series of rocky outcrops and, in an hour or so, see a reasonable variety of inscriptions. Unfortunately we don’t speak Italian and the site was not well presented for speakers of other European languages – we could only buy a guide in Italian for instance. The guide has rock art locations numbered from 1 to 103 (but many numbers are missing) – and perhaps 15/20 of these are worth spending time at – some of the numbered sites on the guide map also proved rather difficult to trace on the ground!. Ladders and platforms are provided to enable one to see awkwardly positioned carvings. Unlike the carvings at Tanum and Alta these are not highlighted by dye and, depending on the light at the time, some can be quite difficult to make out. The Valcamonica area is said to have around 140000 carvings done over a period of 8000 years from Neolithic to Iron Age (but over 80% are Iron Age i.e. from 800BC). Those at Alta (around 5000) are estimated as having been done from 4200BC to 500 BC (or even later) and those at Tanum (around 1500) from 1800 - 500BC i.e. primarily Bronze Age. Comparisons on such matters are invidious but we felt that the Valcamonica site was the least rewarding of the 3. It could have been so much better presented considering that they charge an entrance fee.